Over 150 armed forces veterans wrote to President Ram Nath Kovind against politicising the forces but the Rashtrapati Bhawan reportedly denied receiving it. Union Defence Minister Nirmala Sitharaman on Friday raised concerns about “fake letters” being circulated after the Rashtrapati Bhawan reportedly said it has not received any letter from armed forces veterans. On Thursday, more than 150 veterans of the Indian armed forces reportedly wrote to President Ram Nath Kovind urging him to stop the politicisation of the military in the run-up to the Lok Sabha elections. The letter urged Kovind to “take all necessary steps to urgently direct all political parties that they must forthwith desist from using the military, military uniforms or symbols, and any actions by military formations or personnel, for political purposes or to further their political agendas”. The Congress, however, cited the letter to demand action against Prime Minister Narendra Modi, BJP President Amit Shah and Uttar Pradesh Chief Minister Adityanath. In the letter, the signatories have referred to Uttar Pradesh Chief Minister Adityanath’s statement calling the Indian Army “Modi’s Sena” during a rally in Ghaziabad, Uttar Pradesh, as well as several members of the ruling BJP taking credit for the Balakot air strike. 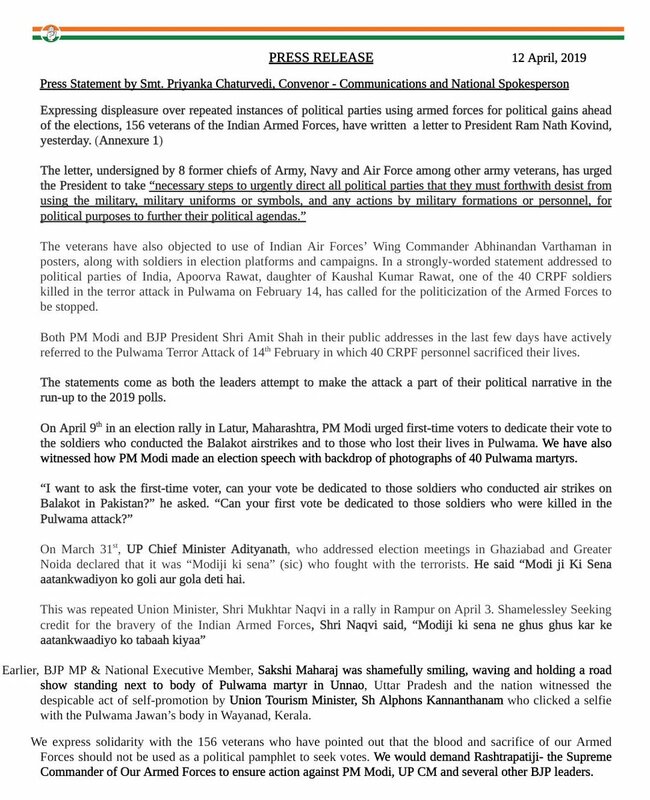 The signatories also said added that they were concerned by “media pictures of election platforms and campaigns in which party workers are seen wearing military uniforms; and posters and images with pictures of soldiers and especially of Indian Air Force Wing Commander Abhinandan Varthaman, displayed”.